Description: the T-Rex stands in an aggressive posture, its head curved to the left and its arms outstretched as if attacking something. The tip of the tail is bent pointing upwards and to the left. It has small pads on its feet to give it extra support. The figure is painted entirely light blue, except for its belly and most of the throat which are coloured white instead. On its neck, back, upper legs and front part of the tail it features various sharp edged black stripes, similar to simple depictions of lightning bolts. Additional black stripes are found on each side of the face, close to the eyes (eye sockets are also black). The figure has small yellow eyes with black pupils, a red tongue and inside of the mouth with white teeth and black edges around its mouth. It also sports black claws on its feet (but not on the hands) and a white JP logo on its left upper leg. The Velociraptor stands in a stalking pose, its right arm and leg stretched outward and its head raised upwards with its mouth open, as if it means to jump on something. The tail is raised upwards and bent at the tip. It's mostly coloured reddish brown (in a slightly shiny hue), though the creature's underside (throat, belly, lower part of the tail) is painted yellowish brown instead. The Raptor carries a long black stripe running from half way of the snout over its neck and back over the first half of the tail. Inside this black stripe two small thin green stripes are located, one on the head and a second one on its back. Two additional black stripes are found on the flanks, running over the very upper part of the limbs to the front half of the tail: these black stripes too each contain a pair of smaller green stripes. The figure also has a thick black spot on each knee. The figure has black claws on all limbs, black eyes with red pupils, a pinkish red tongue and inside of the mouth, white teeth and black edges around the mouth. Lastly, a white JP logo is found on its left upper leg. Analysis: if you're looking for new sculpts in this two-pack, you're wasting your time. Both the Raptor and the T-Rex have been seen too often before already, both in this line and previous JP toy lines. Oh well, at least these new paint jobs aren't a total loss. In fact, the Raptor's colouring is rather original, apart from the abundance of brown. The little touches like the green stripes and the eerie black eyes with red pupils make it stand out a little among its brethren, though also not by too much. At least all the details have been taken care of. The same could almost be said for the T-Rex, except they forgot the claws on the fingers. Also, differently coloured pads under the feet would have been appreciated. The edgy triangular black stripes go well with the light blue colouring, though otherwise there is not enough colour variation in this figure. It could almost pass for a new take on the Camo-Xtreme Arctic T-Rex, though the quality of the paint job is nowhere near as good as that particular figure's paint job was. Who'd win in a fight between these two? My money would be on the T-Rex. Though the Raptor is more agile and has those nasty sickle shaped claws on its feet, you can't compare that to a bulldozing, bulky heavyweight like this little T-Rex. Close call though. Repaint: yes. Both figures are repaints of dinosaurs that originally came with human figures for the JP III line. The T-Rex teamed up with the Military General, while the Velociraptor was paired with Alan Grant. Both figures have been repainted before for JP III Camo-Xtreme, and would be repainted several times again for this line, JPD3 and JP 2009. Overall rating: 6/10. There's nothing new to both sculpts, unless you don't own the previous releases yet. These new paint jobs are okay though, and by Hasbro standards for two-packs, fairly detailed even. 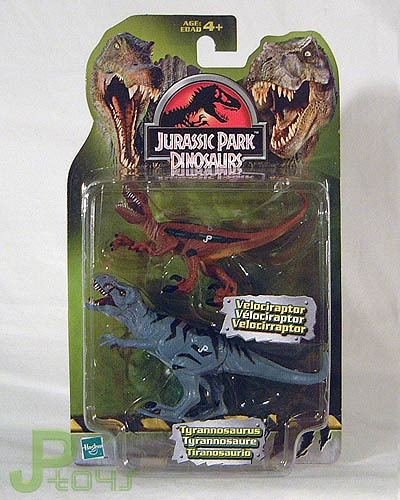 Like most dinosaur two-packs from JPD2 and JPD3, this is one of the more common releases and it can still be found easily, usually for low prices because they're just not in high demand.